The idea of Progress obsesses the modern mind. It is so much a part of modern thinking that it is the air most of us breath. Yet the grand idea of Progress is made up of many contradictory notions that man in his natural state is a brute and is civilized by his institutions that man in his natural state is good and is corrupted only by his institutions; that the possibilities for human improvement are infinite; that the possibilities for human improvement are finite and lead to an harmonious end beyond which no further improvement is necessary: that the State is the major agency of improvement: that the State is the major obstacle to improvement; that unrestrained economic self-interest is the motive power of betterment: that unrestrained economic self-interest turns society into a jungle. that the aim of Progress is equality; that only inequality can guarantee Progress. How is it that, containing so many conflicting strands, the idea of Progress has not torn itself apart? What is the glue which keeps it intact? If there is a single idea or attitude which has the power to do this, it is optimism. Whether we turn to Jean Bodin or Francis Bacon to Campanella or Descartes to Leibnitz or Jean-Jacques Rousseau to Adam Smith, Saint-Simon or Karl Marx we find essentially the same sanguine assessment of human nature and destiny. Ostensibly opposing doctrines are conjoined by their celebration of optimism indeed, if we look at the two doctrines which have exerted the greatest influence over not only the thought but also the deeds of recent times those of Adam Smith and Karl Marx, it would be easy to conclude that those who have seized on them have been trying to outdo one another in optimism. For the modern mind, there is no greater heresy than anti-optimism. We persist in the belief that the future is bound to be better than the past in spite of the fact that with each day that passes the enduring power of human evil forces itself on our unwilling attention. It is not simply, however, that optimism persists in spite of the absence of evidence that the human capacity for evil is receding: it is rather that optimism feeds off evil disaster and catastrophe It is characteristic of the modern mind that the worse things get the better people expect them to become. People can be offered and in some circumstances will accept fear, misery, degradation and death so long as they feel that they are heading towards a glorious future, Whether this glorious future is offered by Hitler or Stalin is immaterial. Apparently opposite ends of a gamut of belief. Hitler and Stalin share the same view of the future as an arena for control , for the breaking of all restraints in imposing on the world an order perfectly in keeping with their own whims. The optimistic mind treats every disaster as merely another obstacle to be overcome on the route to paradise and never stops to reflect that the disaster may itself be the result of the application of optimism If things are bad all we can do is press on to a better future even though it is precisely pressing on to what we believe will be a better future that has helped to make things bad. Optimism makes life entirely future-oriented. It is curious that Albert Einstein should have remarked that he never thought about the future as it comes soon enough, for he has become a symbol of man's capacity to master nature and control the future. A serene acceptance of what each day brings is entirely alien to modern thinking: each day is an opportunity for advancement, personal or collective. To take it as it comes is to waste. "It is from its bearings on the future that Progress derives its value, its interest and its power. You may conceive civilization as having gradually advanced in the past, but you have not got the idea of Progress until you conceive that it is destined to advance indefinitely in the future,"
Optimism embraces the notion that, whatever has happened in the past, the future can be different. Yet at the same time it tries to take the past as evidence to support its belief in the future. History reveals to us that life is always in movement in the direction of betterment. Feudalism becomes capitalism. Privileges are transformed into rights. The illiterate are taught to read. The powerless are given the vote. The old must be destroyed to make way for the new. If the optimistic view of the world can sometimes co-exist with a sickly nostalgia, it never drops the idea that destruction is part of its necessity. That the good may sometimes be destroyed with the bad does not deter the optimist, for the future is the place where a greater good can be realized. It seldom occurs to the optimist that ,once destroyed, some things might be difficult or even impossible to regain. Ultimately, everything is worth sacrificing in pursuit of the future. The conviction that the future can be utterly unlike the past is reinforced by the speed of technological change in the modern world. A person born at the start of the twentieth century in Britain has seen a range of technological innovations which make life today, superficially at least, utterly unlike the life he or she knew as a child. Yet the banal observation that technological advance does not also imply moral advance, though it might be accepted by optimists, impinges hardly at all on their behaviour. An elision takes place through which moral change is assimilated to technological change. This is not surprising as optimism sees science as the essential source of human redemption If there has been evil in the past, it is only because our view of the world and ourselves is insufficiently rational. In principle there is no difference between the problem of evil and that of tuberculosis: both can be cured by knowledge of their aetiology, correct diagnosis treatment and prophylaxis. The notion that there might be fundamental problems of human life which do not admit of solution that as Reinhold Niebuhr puts it: "History is not its own redeemer," is unacceptable to optimism. This insistence on rationality, however leads to a hyper-rationality which is thoroughly irrational. A belief in the unlimited power of rationality limits its real power. Yet to accept a limit to rationality would be to admit the existence of areas which are resistant to transformation in and through time and thereby to undermine the whole project of optimism. The doctrine of optimism is absolute or is not at all. "Self hood is precisely the inescapable awareness of man's contradictory place in the natural order of things." Paradoxically optimism accompanies a weak sense of self for it is uncomfortable with the idea that humanity is at one and the same time part of nature yet not fully embedded in it. The optimists' solution to this irreducible problem is to bring nature fully under humanity's dominion. Yet humanity cannot bring itself under its own dominion. Humanity cannot cease to be its own problem, but it is the conviction that it can which powers optimism. The ancient Greeks held to the notion of the degeneration of the world from a condition of original perfection. As created by the Deity, the world was faultless, but designed to last only a limited time. About halfway through this span began the degradation which would lead to its inevitable extinction if the Deity did not then intervene to begin the process anew. With the arrival of Christianity came the idea of the Fall. These concepts, of degeneration or Fall, express humanity's capacity for self-transcendence. We can imagine a Golden Age, an Arcadia, a time of perfect innocence and peace and harmony because in thought, in moral imagination, we can surpass our creaturliness. The discrepancy between the way we are able to imagine human life and the way it is, leads, in pessimistic philosophies, to a belief in Fall or degeneration and in optimistic philosophies to a belief in perfection in the future. From our modern perspective it is easy to see that the idea of a past Golden Age is an illusion. We are reluctant, however, to see that confidence in a future age of the same kind is equally illusory. Our creaturliness remains the obstacle. Whether we project backwards or forwards, it is impossible to overcome the divisions in our nature. Human life is forever tinged with tragedy for we cannot make ourselves what we can imagine ourselves. We can, however, imagine the pyramids and build them, or imagine the Eiffel tower and erect it, or imagine an aeroplane and make it fly or imagine an information superhighway and bring it into being. When we are working on anything but human nature we have an extraordinary capacity to realize our imaginings. The plentiful and myriad materials of the earth have provided us with the means of proving to ourselves our power to mould reality to our own ends. Nature presents itself as a huge laboratory where, like eager children, we explore and discover to our heart's content. It is when we turn to our own nature that we confront the impossibility of bringing our projects to fruition. The world abounds in utopian theories yet none of them has succeeded in releasing humanity from its contradictory place in nature or its essential self-complacency. Science, however, still clings to the fantasy that this is possible. Whether through the universal prescription of Prozac or genetic engineering that will alter human nature so that the bad tendencies are eliminated humanity so the optimists believe can be delivered into perfect happiness and harmony. The fantasy of a humanity engineered for happiness reveals the hopelessness of optimism for in facing the question of who shall decide on a definition of happiness, who shall determine which traits are to be retained and which eliminated, the simple question of who shall do what to whom, we run up against the intractable fact of the struggle for power. As human life has no intrinsic or transcendent definition, people will always struggle to impose the definition which best suits their interest or temperament. It is sensible to be pessimistic about the possibilities of doing away with this struggle but it is also right to be hopeful that ways can be found of continuing it in as humanised a manner as possible. The irony of the fantasy of unsullied happiness and harmony is that it drives us in the direction of greater dehumanization. We are not humanised by ceasing to feel anxiety or unhappiness or diffidence or aggression or even despair. We are not humanized by putting an end to the struggle to define the meaning of human life. It is through this struggle and the anxiety, unhappiness, aggression, despair, and also joy, hope, serenity, generosity, in short the whole gamut of human emotions, which it engenders that our humanity is realised. Human aggression, for example, is not entirely negative. The fantasy of a humanity from which aggression has been bred out would mean a world robbed of Christ or Shakespeare or Martin Luther King as well as Hitler and Stalin. It isn't possible to fight for justice and freedom or to write great plays without drawing on reserves of aggression. A belief in the possibility of a sanitized humanity fails to understand that the sources of evil and of moral grandeur are identical. It is the weaknesses in our nature that lead to evil and it is the struggle to overcome those weaknesses which confers moral grandeur. The elimination of weakness could produce only a species of gleeful or blank, dehumanized ghosts. This kind of paradoxical thinking is inimical to optimism for when you believe that events are driving forward to ever greater improvement, paradox is suggestive of eddies, or even of cul-de-sacs. The hedged idea of seeking improvement while knowing that it will be difficult and is attended by the peril that in the very act of change you may make things worse is too provisional for optimism. The escape from pessimism which began in earnest in the sixteenth century is what has made possible centuries of breathtaking scientific and technological advance. To suggest that caution about Progress is necessary is to suggest also that the people who effected this transformation were too bold. Yet without this boldness, comforts we take for granted would never have been attained. We should, therefore, press ahead in the same bold manner. But this argument misses the facile point that technological advance does not necessarily imply advance of any other kind, even social. On the contrary, it could easily be argued that the technological advance of the nineteenth century brought with it a degradation in social relations. "We can affirm that the whole world is now known and all the races of men; they can interchange all their commodities and mutually supply their needs as inhabitants of the same city or world-state"
The anonymous inventor of the mariner's compass had opened the world to the possibility of trade and for Le Roy this provides an exciting and optimistic prospect. Two hundred years before its publication this little comment of Le Roy's adumbrates Smith's Wealth of Nations. The possibility of the attainment of universal prosperity: the idea that humanity could become one ecumenical body conjoined in the pursuit of wealth, the glimpse of a world in which riches which had once been known only to a tiny minority might be enjoyed by all; these were powerful stimulants and they tended to sweep aside all objections. It is difficult to raise moral objections against utopia One objector, however, was David Davies, rector of Cookham. Berkshire who in The Case of the Labourer in Husbandry 1795 argued that. “…for a dubious economic benefit, an amazing number of people have been reduced from a comfortable state of partial independence to the precarious condition of mere hirelings, who when out of work immediately come on the parish." The cause of distress, of course, was enclosure which had been transforming the English countryside, sometimes slowly, sometimes more rapidly, since the first Statute of Merton in 1235. Davies's view of the economic benefits of enclosure as "dubious" clashes with the prevailing economic optimism. Davies is percipient and sees the kind of society to which the developments he is witnessing might lead: the majority of people having no independent means of life and therefore having to rely first on the parish and later on the state when the vagaries of the system throw them out of work. Unlike Adam Smith for whom the negative aspects of capitalist development deserve only the occasional aside, for Davies the loss of independence even partial is too big a price to pay. The irony is that it will later become and remains part of the dogma of the apologists of capitalism that the problem with the poor is that they won stand on their own two feet. Here is a simple but clear example of how optimism was able to override objections to the changes it brought about. It is true that the enclosing landlords were pursuing their economic interest and that this impelled them to act as they did often with no thought at all for the consequences of their actions on the villagers who were left without a livelihood, and in some cases, a home. But this pursuit of economic interest did not work through them in some unconscious fashion. They were not agents of an impersonal historical will They were, from the early sixteenth century, acting in accordance with the prevailing intellectual spirit. If they ignored those voices which told them they had a moral duty towards their tenants, it was because they believed that such a moral duty was obsolescent. The future would be one of trade, and this would be to everyone's benefit, Therefore, in enclosure, economic opportunism tallied with moral duty. It became a moral duty to ignore one's moral duty to one's tenants in order to press on to the bright future offered by trade. To have missed such an opportunity would have been a moral fault. Optimism made a moral duty to the future more important than that to the present. "All our marvellous inventions are just as powerful for evil as they are for good." The very idea of evil has been marginalised by the arrival of Economic Man. Once all human relations are reduced to the single idea of a balance of economic forces, each individual pursuing his self-interest in a system in which extra-human forces intervene to smooth out conflict and disharmony, it becomes senseless to talk any longer about evil, for such a concept implies that individuals must struggle endlessly against the worst in their natures; a struggle alien to the optimistic view of humanity. There is a sense in which it is true that the modern world is so evil because the idea of evil has been expelled from it. The destiny of humanity is to pursue wealth and this is done best by the free-play of self-interest. The ancient notion that native self-complacency and egocentricity must be subjected to ceaseless moral restraint, is cast aside. Economic Man cannot admit moral considerations, for if it were once allowed that we owe an inescapable moral duty to one another, the world economy would collapse. A business decision is purely a business decision and exists quite outside the moral sphere. That if may result in the decimation of communities, the destruction of individual lives, that it may bring the four horsemen of the Apocalypse galloping over the horizon is of no consequence There must be an absolute freedom to make decisions on purely economic grounds because we are expected to believe, by so doing we are bound to arrive at the best of all possible worlds. To dispel moral striving from the arena of business is purported to be a moral position as all moral improvement is assumed to depend on the unlimited expansion of wealth. This illusion that it is possible to create a sphere of human activity which is entirely free of moral decisions is the flimsy intellectual basis of modern capitalism. In order to build the future, in order to build the world of wealth that will benefit all, in order to see the optimistic vision of humanity realised, moral striving must be pushed to the periphery. The conviction that the indefinite expansion of the wealth of the world would open the gates of paradise, has militated against the operation of the only thing that saves us from hell: our innate capacity for moral striving. 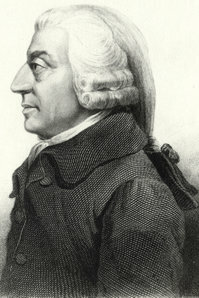 If Adam Smith makes moral striving redundant on the grounds that the weakness of self-interest is transmogrified into the source of our deliverance when it is permitted free rein in the pursuit of wealth and that the "invisible hand" shall make such adjustments as are necessary to avoid economic or social disaster, so that we can glibly seek our own advantage without a thought of what our actions imply for others. Karl Marx dispels moral striving in an equally cavalier way by asserting that the impersonal force of History shall drive humanity to a moral end whether it chooses to get there or not. Apologists for Marxism might argue that a moral opposition to capitalism is implicit in Marx's work. 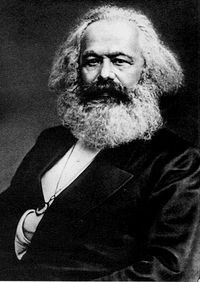 Unfortunately, Marx explicitly argues that it is not by moral choice that humanity arrives at a particular destination, but because of the "definite" economic relations into which people are forced to enter and which are "independent of (their) will" It is easy to excuse Marx by saying that he exaggerated in the interest of clarity. Marx, just like Adam Smith, robs humanity of that necessity for moral striving which is our best defence against alienation He may have railed against the dehumanisation and alienation of capitalism but his own view of humanity is thoroughly dehumanized. He does not appreciate that you cannot arrive at a moral end without choosing to do so. To invoke History working through a seemingly utterly virtuous proletariat in order to bring humanity to a stage of society from which evil shall be expelled, is simply a tired reworking of age-old utopian fantasy. Marx has no remedy for the evil he sees so clearly in the workings of capitalism. He is a victim of the optimistic doctrines of his time just as much as Adam Smith. Ostensibly the bitterest of rivals, Marx and Smith are in fact enthusiastic comrades and co-workers in optimism. “…modern man is... so certain about his essential virtue because he is so mistaken about his stature." An uneasy conscience and a sense of tragedy are concomitants of a realistic appreciation of the stature of humanity. People can live with an easy conscience only when they are sure that nothing they have done, do or can do, could be evil. Optimism permits people this illusion by convincing them that they are part of a process of betterment and that so long as they fulfil their duty to this process, nothing they do can be wrong. Presumably the clerks at Drancy who went on sending Jews to the gas chambers even after Hitler was dead and the war obviously lost, believed that their punctilious conscientiousness was the same thing as a morality or that such diligence made moral striving redundant. Optimism offers people relief from moral striving by making a categorical agreement with the system the test of all virtue. There is no need to question the system for the system means Progress and is therefore beyond question. In so far as debate can take place this is tolerated only within the boundaries of Progress. Optimism conveys the sense that we are being carried along towards an improved destination and must therefore only set our shoulder to the wheel to be free of an uneasy conscience. The short history of humanity embraces no dearth of brutality but ours has been an especially brutal century. Yet we look back in horror at, for example, German fascism and see it as an aberration. Millions admire Schindler's List which flatters them with the illusion that they could never behave like those awful Nazis. Our lack of a sense of tragedy is exemplified by the fact that the evil of Hitlerism can become the basis of a blockbuster movie providing Saturday night entertainment across the globe and a subject for dinner-party chatter. We can be optimistic because we know that fascism is behind us. Yet Hitler was no aberration. The philosophy of Adam Smith which tells us that it is the self-interest of the butcher, the baker, or the brewer which will provide us with our dinner leads directly to the Nazi death camps; for if we have no appeal to human conscience what stops us from being disposable? If the perceived self-interest of the German nation requires the elimination of the Jews. how do we argue against this if we have accepted that perceived self-interest must become the organizing principle of society? It was a very short step from dragooning people as mere "units of labour" into the factories of Europe during the Industrial Revolution and after, to herding them into death camps when they had become "superfluous. What prevents people being seen as superfluous is the right to appeal to conscience, to a sense of humanity, even from those who provide us with our dinner. Adam Smith is as incapable as Karl Marx of framing a theory which takes human evil fully into account . His view of humanity is just as partial and dehumanized and his naive faith that in laissez-faire he has discovered an exit from the problem of evil is at once touching and horrifying. Meticulous though it is The Wealth of Nations, just as much as Das Kapital, is founded on a false premise. Implicit in every line is the belief that the pursuit of wealth is the sole destiny of humanity. Once again it is too easy to excuse Smith on the grounds that he took a narrow focus in order to illuminate a discrete area of experience. His theory elevates that area over all others and explicitly dismisses the belief that self-interest needs to be submitted to moral restraint. Smith's narrowness of focus is precisely the source of his dehumanized version of life. Only now and again does he cast a wistful glance over his shoulder at the world he is helping destroy and wonder whether he might be giving birth to an illusion. That the feeble intellectual base of Smith's theory, like Marx's, has not prevented it from having an enormous influence over human action only points to the deluding power of underlying optimism. Smith and Marx are both confident that in discovering essential laws of society they can predict and control the future, This element is much more explicit in Marx but it is a clear assumption in Smith. They both try to behave like scientists and their view of science is, of course, thoroughly naive. In the post-Popperian world it is easy to see where they went wrong: they accept induction and assume that sufficient accumulation of evidence proves a theory. They also fail to recognize that procedures which are applicable to the study of the natural world are inappropriate to society. They do not understand what we now see much more clearly: that the meaning of human life is something we create as we live it. “...the art of making yourself rich, in the ordinary mercantile economist's sense is.... the art of keeping your neighbour poor." "...the quantity of our labour we die in." Carlyle spoke of the "calamitous" nature of work". How different this from our modern view of work as a form of self-realization or the means through which we shall achieve the deliverance of prosperity. Carlyle and Ruskin insisted time and again on the moral nature of economic relations and for that reason rejected the amoral, economic determinism of both Smith and Marx. Even Carlyle's foolish defence of slavery was essentially on the basis that it was an institution in which one person's duty to another was not obliterated, while the economic relations of capitalism dismissed such a duty as outdated and an encumbrance to progress. Yet while Carlyle and Ruskin are pessimists, they are not prophets of despair. The paradox of optimism is that it increases hopelessness. The great optimistic revolutions of 1789 and 1917 descended into the hopelessness of terror and totalitarianism. Mrs Thatcher was elected in 1979 and kept in power throughout the eighties on a great wave of optimism: Britain could be great again; the state could be rolled back; the individual could flourish. The reality has been continued relative economic decline, mass unemployment, rising crime, drug pushers in school playgrounds, bitter social division, a loss of faith in the power of democracy to effect change. The despair at the heart of modern Britain flows directly from the foolish optimism that the free market can solve all human problems which is itself merely a disguise for the pursuit of a politics of cruelty. When people are cajoled indoctrinated and educated to expect too much from the world they tend to lose the capacity to fight off despair when things go badly, and despair brings in its wake terrible evil. A leaven of pessimism is indispensable to a view which can work for improvement while recognizing that every step forward brings inevitable peril and that the world is not so constituted that things will turn out for the best if only we believe they will. Scepticism towards optimism is the best defence against hopelessness, but in order to give its due in our conception of things, we will have to examine and overturn centuries of resolutely optimistic thinking.